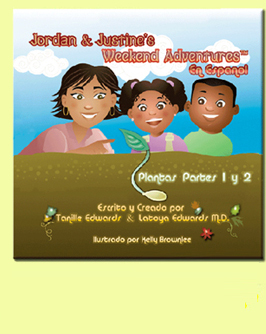 is an educational ride exploring plant growth, the history of peanuts, healthy eating habits, photosynthesis and family relationships. Jordan and Justine start out by helping their mother in the garden on Saturday morning to plant pumpkin seeds. From there, the brother and sister pair learn how seeds sprout into plants, the health benefits of pumpkins, the history of peanuts, how to research on the internet and then they use their magical powers to get an up closer look at photosynthesis. And now available in Spanish! Jordan & Justine's Weekend Adventures™: Plantas Partes 1 y 2 es una gira educacional explorando el crecimiento de las plantas, la historia del maní, saludables hábitos de comida, fotosíntesis y relaciones familiares. 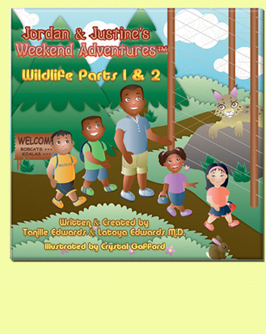 Jordan & Justine’s Weekend Adventures™: Wildlife Parts 1 & 2 brings children right into the center of animal life at a wildlife conservation center. The brother and sister pair, Jordan & Justine, and their two friends Raj and Ling learn how koalas live, what it means when an animal is said to be endangered, and how humans can help. Jordan and Justine use their magical powers to explore the world of dolphins, to find out how laws protect wildlife, and to learn what it means to be a mammal. 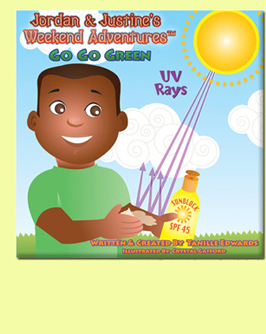 Jordan & Justine’s Weekend Adventures™: Go Go Green takes children on an exciting, high-flying adventure as they learn to go green. Jordan and Justine are part of a Go Go Green campaign in their community, and they teach young readers about the environment, how to take steps to save energy, how to participate in their community, and why it is important to care about the earth! Children will also learn new words in Spanish. at all bookstores nationwide and online at retailers everywhere!